The technological challenges of the 21st century make compliance a necessary feature in ensuring the safety and security of individuals around the globe. However, with so many new and changing regulations, the use of manual compliance systems are no longer sufficient in establishing or maintaining a framework for conduct and accountability. 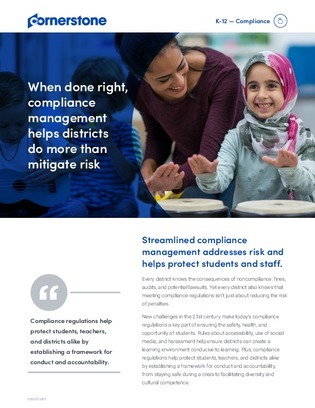 In this white paper, explore how K-12 districts are using learning management software to help meet the challenges of evolving compliance standards with ease.